A word for busy, organized, high-achiever women! Hello. My name is Debbie Chavez, and I’m a list-aholic. Yes, I admit it. I love being super- organized, and I love “accomplishing” a lot every day. It makes me feel good about myself. In fact, my compulsion to accomplish tons of stuff everyday is so bad…..if I do something that was not on my list, I actually add it onto my list so that I can scratch it out! So, maybe you and I should stop being neurotic about our lists! I am still making a list each day, but unless something on that list is absolutely critical, I’m allowing myself to skip some of the items in order to respond to my husband or children if I can see that they could use my help or encouragement. I believe this adjustment makes me more like the 1 Peter 3 wife. She is described as having a gentle, quiet spirit. I don’t think she could be quiet and peaceful if she was running around like a chicken with her head cut off! She obviously wasn’t a slave to a long to-do-list. 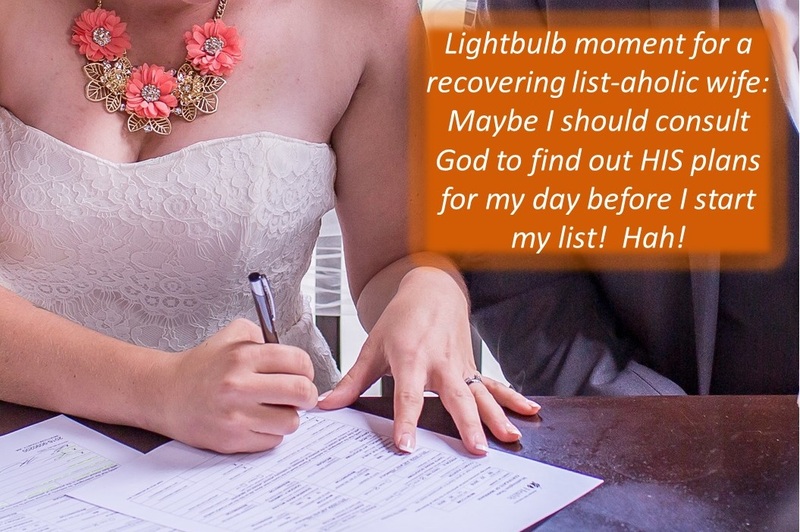 The question is: Do you need to re-evaluate your lists?